Two-hundred sixty-eight private colleges and universities will increase its tuition and other fees this school year 2017 to 2018. This is after the Commission on Higher Education (CHED) approved their applications. 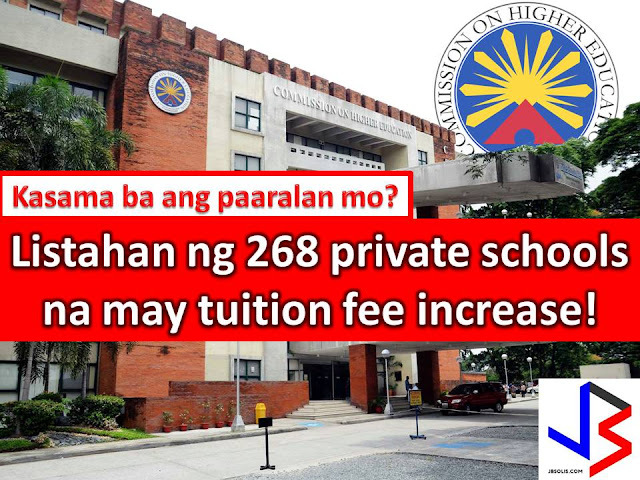 From 268 higher education institutions (HEIs), 262 will increase only their tuitions by an average of 6.96% or P86.68 per unit. The average increase in school fees is 6.9% or P243. According to CHED, 268 represents 16 percent of the total 1, 652 private institutions in the country. CHED assures that HEIs meet the guidelines provided by law, especially the requirement of consultation, the proper allocation of tuition fees, and strict adherence to the processes that seek to make tuition and other school fee increases transparent, reasonable and affordable. Seventy percent of the increase will be allotted to salaries and benefits of faculty members and staff, while 20 percent will be for the development of school facilities. The other 10 percent will serve as the return on investment of the institution.